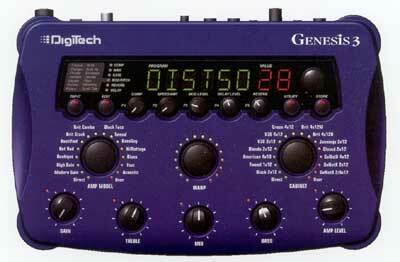 DigiTech Genesis3. January 20, 2001. Desktop guitar processor for recording and live performance. Uses GeNetX, DigiTech's newest amp and cabinet modeling technology. Users can create amp and cabinet models quickly and easily. Mix any of the 12 amp and acoustic guitar models to create new sounds. 48 model/effect presets, and room for saving 48 new creations. New amp models can be created with the unit's controls or via the included GeNetX Editor/Librarian software (PC and MAC) and then downloaded into the unit. Presets and libraries can be shared and traded with other guitarists through DigiTech's Web site. Uses DigiTech's powerful Audio DNA tone engine for up to 11 studio-quality effects at a time. Auto swell, chorus, flanger, phaser, triggered Hanger [? ], triggered phaser, tremolo, pitch shift, detune. Whammy, ya ya, auto ya, synth talk, envelope filter and rotary speaker. Compressor, noise gate, 3-band EQ with sweepable mid, panning and multiple delay and reverb settings. Each effect has up to five adjustable parameters that can be easily accessed using the front panel turn-knobs. By connecting the optional floor expression pedal, users can also change parameters while playing. Five front panel turn-knobs. Optional external expression pedal. 24-bit A/D/A connections, 1/4" input jack, CD inputs, MIDI in and out/thru jacks, independent 1/4" left and right stereo outputs, S/PDIF digital output to connect to a digital recording device such as computer sound card. I'd like to see a comparison of this vs. J-Station. The branding is different; Johnson J-Station vs. DigiTech Genesis3. 1 = Tech21 SansAmp, or DigiTech 2101, or DigiTech RP100. I believe DOD, DigiTech, and Johnson are 3 names for the same company.